Paper Mario, known in Japan as Mario Story (マリオストーリー or Mario Sutōrī), is a console role-playing game video game developed by Intelligent Systems and published by Nintendo for the Nintendo 64 game console. It was first released in Japan on August 11, 2000, in North America on February 5, 2001, and in Europe and Australia on October 5, 2001. 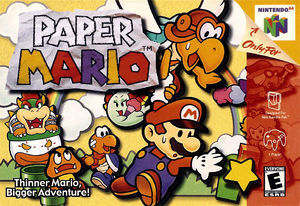 Paper Mario was re-released for Nintendo's Virtual Console in 2007. Paper Mario is set in the Mushroom Kingdom as the protagonist Mario tries to rescue Princess Peach from Bowser. To do so, he must locate seven "Star Spirits" to negate the effects of the captured Star Rod, which grants invincibility to Bowser. The player controls Mario and a number of partners to solve puzzles in the game's overworld and defeat enemies in a turn-based battle system. The battles are unique in that the player can influence the effectiveness of attacks by performing required controller inputs known as "action commands." Paper Mario is the first installment for the Mario role-playing games Paper Mario series and is the predecessor to the GameCube game Paper Mario: The Thousand-Year Door and the Wii game Super Paper Mario. The game received a positive reaction from the media, attaining an aggregate score of 88% from Game Rankings and 93% from Metacritic.It was rated the 63rd best game made on a Nintendo system in Nintendo Power's "Top 200 Games" list in 2006. The boxes containing each file in the Select File menu are glitchy when changing selections. Disabling Enable Dual Core will resolve this. Refer issue 7143. The Widescreen Hack is Shifted to the Left and has clipping issues that can be fixed with an AR Code. Or this alternate Gecko code. The graph below charts the compatibility with Paper Mario since Dolphin's 2.0 release, listing revisions only where a compatibility change occurred. r7570 Windows 7 Intel Core2 Duo E7400 @ 3.2GHz NVIDIA GeForce 9600 GT 20-25FPS. Savegames are loading correctly. No HLE sound, but LLE works fine. 3.0-204 Windows 7 Intel Core i7-2670QM @ 2.2GHz NVIDIA GeForce GT 525M 55-60FPS at 1600x900. Music sometimes doesn't play or is too quiet/too loud. 5.0-3255 Windows 10 Intel Core i5-4690K @ 3.9GHz AMD Radeon R9 200 30FPS in battle, 30FPS in the over-world, drops 5-10 frames in certain areas. Audio is fine with the only exception I found in the area behind the Goomba Village when you fall, were the audio clips into itself and pops allot. Setting audio backend to OpenAL minimized this, changing HLE to LLE had the same result. Audio stays at full speed regardless of FPS during testing. Minor lag spikes that cause the game to freeze for a split second every so often. No crashes or errors, tested in both 3x and 2x native resolution and got the same results. Duel Core enabled and D3D12 as the backend, D3D11 while not fully tested seems to produce the same results. This page was last edited on 1 March 2018, at 04:48.